Frost Brewed College Hockey: Onward to Lake Placid and the DIII Frozen Four! 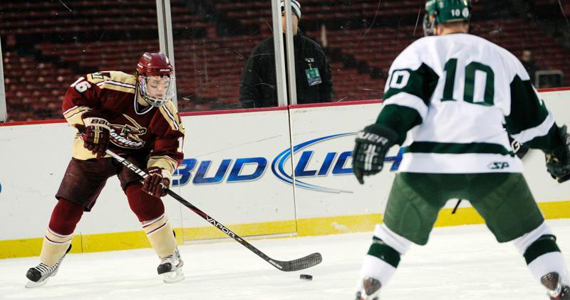 Big League Clu previews the Division 3 mens Frozen Four, which starts tonight! So upon completion of the first round and quarterfinals of the NCAA DIII Hockey championships, I am following up with the Frozen Four breakdown. The DIII Frozen Four will take place in Lake Placid, NY at Herb Brooks Arena (for those of you who don’t know Herb Brooks, he coached the 1980 Miracle on Ice USA Olympic hockey team), on Friday March 16th. Anyways, lets dive into the Frozen Four match ups shall we? The Semis: DO YOU BELIEVE IN MIRACLES?! What haven’t I already covered about the Green Knights? Actually, nothing if you were paying attention. The key to winning this semifinal match up against a very hungry, and challenging opponent, like Norwich will be Goaltender David Jacobsen. Jacobson’s GAA (Goals against average) this season was 1.68 and he ranked first with a .933 save percentage… For those of you who don’t know what those numbers represent, they are very damn good. On the other side of the rink we have the Cadets, who have more offensive firepower than the entire Vermont National Guard. They have three players with 35 points or more. St. Norbert will certainly have their work cut out for them if they want to make it to the finals. Who will win? In hockey, or any sport for that matter, offense kills and defense wins championships. Even though St. Norbert boasts one of the best goaltenders at the DIII collegiate level, Norwich also has a top goalie who averaged a 1.91 GAA this season. So, even though the Green Knights have the D, they don’t have the offense to match up with Norwich. Norwich wins. 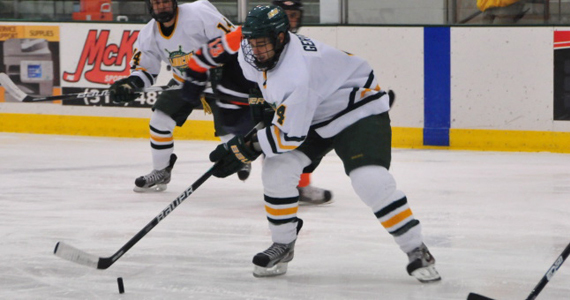 Fresh off their 5-0 shutout over Elmira College in the quarterfinals, the Oswego State Lakers face their toughest challenge yet, as they set to do battle against Amherst College. The Lord Jeffs (yes that is their team name) are lead by SR. Goalie Jonathan La Rose and his disgusting GAA and save percentage (1.53/.943). La Rose will most certainly make scoring hard on the Lakers. But, do you think the Lakers are intimidated? They have not one, but two (yes count ’em)… TWO goalies who have a 1.68 GAA average! Oh, and I failed to mention that they have three players who can score at will. Leading the way is Forward Jon Whitelaw, who had 40 points on the season (19G, 21A). Everyone better bring a change of clothes for this match up because things could get a little messy for those in the stands. Who will win? 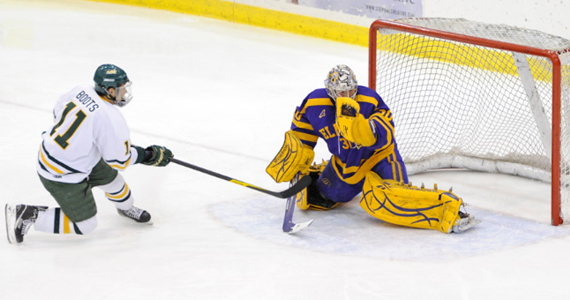 Without being egocentric (I am a Oswego Alum), I will, of course, say that the Oswego State Lakers should be able to hang with the Jeffs, I would not be surprised to see this go into OT, but it should be one hell of a hockey game though! Lakers win! PREDICTION TIME: WHO WINS THE WHOLE FLIPPIN’THING??? So I am sure that everyone is dying to know who I think will skate away with the national championship trophy. My answer, of course, is that Oswego State will defeat Norwich University. The Oswego state Lakers will be hoisting the National Championship banner next season! Massive celebrations will happen all throughout the city of Oswego NY. Bars will go crazy and people will pour into the streets to celebrate as if they were Cubs fans celebrating their first championship in 106 years. Meanwhile in Norwich, Cadet fans will riot much like Vancouver fans did when the Canucks lost the Stanley Cup. The city will be set ablaze and the riot police will have to shell out tear gas, beat civilians and taser the unruly! !…Well maybe this is just a little bit of a dramatization, but nonetheless, I hope that Oswego wins the title and all will be well in upstate NY!